If you are looking for some fast action for striped bass, it might be time to turn your attention to the upper reaches of Lake Mead. The fish are on the smallish side, and it is a bit of a drive, but according to Don Martin of Striper Hunters, the action has been good enough recently to make the trip worth the effort. “Since the end of May, we have been tearing them up, with just a few exceptions,” Martin said in an email this week. Martin likes to work the east end of Lake Mead between South Cove and Temple Bar, and he generally takes his clients fishing at night. Since Martin and his anglers are fishing during the dark of night, he prefers to fish under lights “to bring ’em up.” The light attracts bugs and little fish. The little fish then draw in the striped bass and other predatory fish looking for an easy meal. His light setup includes two green Hydroglow submersible lamps and four 12-volt shop lights fixed to the boat’s rail. “We have had two nights where we caught 199 fish,” Martin said. 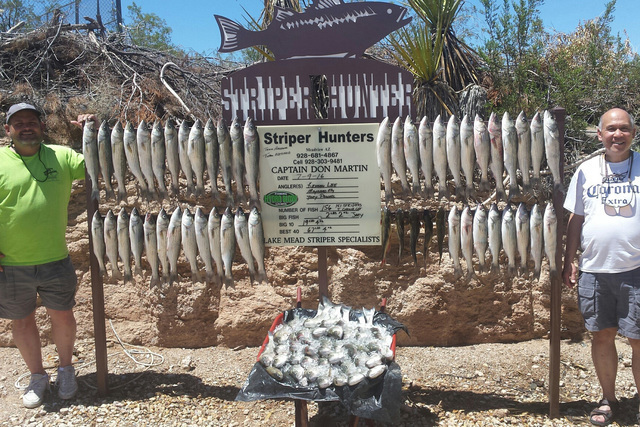 One of those nights was with two Utah fishermen who came south to find out if the stories they heard about Lake Mead striper fishing were true. It would seem they went back to Utah with a few stories of their own. If my calculations are correct, the two averaged 28 fish per hour. That’s a fish every two minutes for seven hours. On another occasion, Las Vegan Kensen Lee, a friend of Martin and I, brought Reno resident Maynard Ely to Meadview for a Lake Mead striper experience. My guess is that somewhere between there and the reservoir someone started talking a little smack because the anglers decided to have an impromptu fishing contest. “The silly boys challenged me and my intern, Joey Powell, to a fishing contest. Team Nevada got smoked,” Martin said. That night, the four anglers accounted for 156 fish in the boat, but it was Powell who went home with an extra $20 in his pocket. Over the years, some people have told me they don’t like bait fishing because all you do is wait for a fish to come by. I suppose that’s true to a point, as waiting is part of the game. But you still have to know where to do the waiting. Martin has been doing his waiting primarily in the Virgin Canyon area. The Lake Mead water elevation is around 1,072 feet. Access at the South Cove launch ramp is limited to one lane for boats of any size. The base is a pipe mat, and the National Park Service recommends using a four-wheel drive vehicle. At Temple Bar, two lanes are open with boaters launching any size vessel on a pipe mat. Four-wheel drive is recommended. A Cedar City, Utah, man was arrested Saturday for the illegal killing of bull elk near a Lincoln County farm in August 2015. The arrest came after a yearlong investigation that started with a series of blurry images of suspects leaving the crime scene on a four-wheeler. Officers with the Utah Division of Wildlife Resources arrested Zackry Holdaway, 26, on Saturday. He was released Monday on $10,500 bail, and faces multiple charges. The only part of the elk taken was the animal’s head; the rest was left to rot. Applications are being accepted for a special sage grouse hunt in Unit 033 on the Charles Sheldon National Wildlife Refuge in Washoe and Humboldt counties. The first season is scheduled for Sept. 17 and 18, and the second season Sept. 24 and 25. The hunts are limited to 75 hunters per season. The application deadline is 5 p.m. Aug. 5.